Hoarding disorder is a mental health condition that has been added to the DSM-5 and ICD-11. We talked to Dr. Gregory S. Chasson and Dr. Jedidiah Siev, two clinical psychologists and researchers who are experts on this disorder, to hear what hoarding disorder is and isn’t and to learn about how research is informing treatment. Why do you think it is important that hoarding disorder has been recognized as a unique mental disorder in DSM-5 and ICD-11? Until the publication of the DSM-5, hoarding was long considered a subtype of obsessive-compulsive disorder (OCD), yet hoarding tendencies only emerged as one criterion in the entirety of the DSM-IV (i.e., for obsessive-compulsive personality disorder) (Mataix-Cols et al., 2010). There are many benefits to recognizing hoarding disorder as a standalone condition in nosological systems. Separating out hoarding from other conditions may facilitate more resources and attention from the public, funding agencies, and advocacy groups; that is, it is easier to disregard hoarding if it has been lumped together with OCD, for example. Breaking out hoarding from other conditions also promotes innovative solutions instead of starting out with assumptions. How is hoarding disorder different from the usual forms of OCD? Differences and similarities between hoarding and OCD have been discussed in the research literature (e.g., Mataix-Cols et al., 2010). Both hoarding and OCD are characterized by compulsive behaviors that function to decrease distress – often fear-based. In the context of hoarding, this distress often stems from a concern about discarding items because they may need the objects later, the possessions are important to their identity, throwing away the stuff would contribute to environmental waste, and an assortment of other beliefs. These concerns often resemble obsessions in OCD, but they tend to be more ego-syntonic than traditional obsessions observed in OCD. That is, hoarding-based preoccupations tend to be more consistent with the individual’s values, less intrusive and distressing, and less repetitive and uncued. Hoarding and OCD also demonstrate differential patterns of clinical and biological correlates and treatment response. What types of people are hoarders and what motivates them to hoard? Hoarding disorder is evident across cultures, and there is no specific type of person who hoards, per se. There are vulnerability factors that influence or motivate hoarding, however, and these can be more or less specific to hoarding. Nonspecific risk factors (in the sense that they are associated with other disorders, too) include trauma, mood and anxiety symptoms, and interpersonal loss. For example, although trauma can lead to many other types of symptoms, some individuals experience their saved items as protective or comforting. More specific factors include, but are not limited to, attentional and organizational difficulties, beliefs about objects, extreme sentimentality, and a sense of responsibility toward objects. Because of these tendencies, people experience strong positive emotions (e.g., excitement, happiness) that reinforce hoarding behaviors. They also experience strong negative emotions (e.g., anxiety, guilt) that are alleviated by hoarding behaviors. Is the problem solved when you simply help the persons clear out their houses? No. Clutter is the consequence of core features such as difficulty discarding and excessive acquisition, and the processes that maintain those. Simply clearing out the space temporarily reduces clutter, but does not address any of the fundamental causes of the clutter. Therefore, even if the individual with hoarding disorder agrees to the clean-out, over time the space will likely become cluttered once again. Forced clean-outs are not only ineffective, but are likely to be traumatic and lead to mistrust, vulnerability, and barriers to future efforts to reduce clutter. For example, one of us worked with someone whose house had been forcibly de-cluttered years earlier by a government agency. Years later she would experience anxiety when encountering any government vehicle, however unrelated to housing or law enforcement. She would flee the area because of the irrational fear that the government employee might sense that her house was cluttered and initiate another clean-out. Sometimes, however, clean-outs are necessary if there is a life-changing and time-sensitive consequence to the hoarding, such as legitimate threats of imminent eviction or prosecution. In those high-risk cases, it is still important to include the individual with hoarding as a collaborator in the clean-out process. What is the latest research telling us about hoarding disorder? Much of the psychosocial treatment literature over the last year has focused on the adaptation of cognitive-behavior therapy for hoarding to a group format, with promising results (Ayers et al., 2018; Bodryzlova, Audet, Bergeron, & O’Connor, 2018; Ivanov et al., 2018; Moulding, Nedeljkovic, Kyrios, Osborne, & Mogan, 2017; O’Connor et al., 2018). Recent psychosocial studies have expanded on the cognitive processing deficits or difficulties in hoarding, e.g., decision-making (Pushkarskaya, Tolin, Henick, Levy, & Pittenger, 2018), psychological inflexibility (Ong, Krafft, Levin, & Twohig, 2018), and neuropsychological profile differences of individuals with hoarding plus squalor versus those with squalor alone (Lee et al., 2017). What would you say is the gold standard treatment approach for hoarding disorder? The gold standard treatment for hoarding disorder is cognitive behavioral therapy (CBT). There is some evidence that serotonin and serotonin-norepinephrine reuptake inhibitors may be helpful for hoarding. What research are you personally undertaking into hoarding disorder? Dr. Chasson’s lab has recently focused on public perception of hoarding and recently published a paper identifying the components of stigma associated with the condition (Chasson, Guy, Bates, & Corrigan, 2018). Similarly, data collection is ongoing for another study examining the degree to which reality television shows about hoarding impact stigma. Patient motivation for hoarding treatment is also a prime target for research in Dr. Chasson’s lab. One pilot study is nearing completion and is investigating the use of virtual reality to enhance motivation for change in adults with hoarding. Family-based interventions are also being investigated as a framework for enhancing motivation. Dr. Siev is primarily interested in cognitive factors that contribute to hoarding. Recent and ongoing projects in his lab focus on how individuals who hoard make important decisions, the extent to which anticipated regret influences decision-making about acquisition, and loss aversion, which has to do with people being more sensitive to losses than similar gains. Gregory S. Chasson, PhD, is a licensed clinical psychologist, Associate Professor in the Department of Psychology at Illinois Institute of Technology, and owner of Obsessive-Compulsive Solutions of Chicago. His research laboratory at Illinois Tech (i.e., Repetitive Experiences and Behavior Lab – REBL) and clinical work focus on obsessive-compulsive spectrum conditions (including hoarding), autism spectrum conditions, and anxiety and traumatic stress. He received his PhD at the University of Houston and completed pre- and postdoctoral fellowships at Harvard Medical School at McLean Hospital and Massachusetts General Hospital, respectively. Jedidiah Siev, PhD, is a licensed clinical psychologist and Assistant Professor in the Department of Psychology at Swarthmore College, where he directs the Swarthmore OCD, Anxiety, and Related Disorders (SOAR) Lab. Previously, he founded and directed the OCD and Related Disorders Program at Nova Southeastern University, after completing training at the Massachusetts General Hospital and the University of Pennsylvania. Dr. Siev has considerable clinical and research experience with individuals who have hoarding, obsessive-compulsive, body dysmorphic, and anxiety disorders. 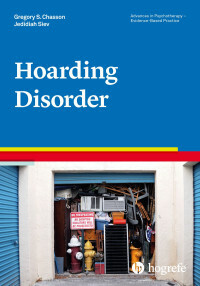 A hands-on, evidence-based guide on the assessment and treatment of hoarding disorder, with particular emphasis on the recommended first-line treatment: CBT interweaved with psychosocial approaches.